Faulkner made his recording debut with the band on the 2014 project after he replaced founding member K.K. Downing following his retirement in 2011. Last summer, frontman Rob Halford revealed the US Top 10 debut inspired the group to return to the studio. “We have such an incredible reaction to Redeemer Of Souls that that really motivated us to crack the whip and get on with making the next record pretty quickly,” Halford told Sixx Sense With Nikki Sixx co-host Jenn Marino. “The clock is ticking, you know. We can’t afford to wait three years, or five years now, to make the record. And especially while we’re having this great, kind of vibe with the fans and just this massive Priest family love fest type of deal. 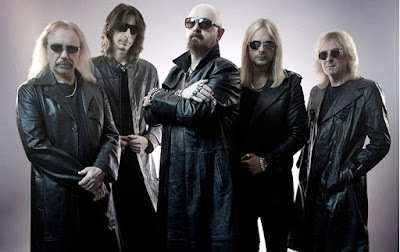 On March 25, Judas Priest will release “Battle Cry”, a live package that captures the band at Germany's Wacken Festival last summer in front of an audience of 85,000. The set will be available as a 15-track CD, with the entire show on Blu-ray and DVD, as well as digital audio and video formats.